Mila is a whole, raw food, a natural source of Omega-3 fatty acids, antioxidants and phytonutrients and is a superior plant-based source of protein and fiber. As an added benefit, Mila is gluten-free, trans fat-free, sugar-free and non-GMO. Mila can also be deliciously combined with many foods, including oatmeal, yogurt and cereals. It’s shocking that despite all the advances in medicine and nutrition, world health is actually getting worse. And the reason is simple: we’re digging our graves with our teeth! The advent of frozen food, fast food restaurants and microwave meals has dramatically lowered the quality of nutrients we receive. And you can see the results in the huge increases in obesity and degenerative diseases today. The solution is simple: improve your diet and you improve your heath. Mila, The Miracle Seed, is gluten–free, trans–fat free, sugar–free, high in fiber and protein, has no taste or smell and can be deliciously combined with many foods! Mila’s supreme biological properties are not diminished by heat in the baking process, therefore making Mila easy to incorporate into your favorite recipes. Mila™ is a mixture of Salvia hispanica L. seed which has been carefully selected to maximize its nutritional value. The Mila mixture is mechanically processed using a proprietary system that optimizes the bioavailability and increases its nutritional value. Nothing is added to the Mila product – it is a pure form of Salvia hispanica L. and is simply the best available today. Mila’s power for improving health! Given today’s typical dietary habits, finding additional sources of Omega–3’s is more important than ever. To help offset that negative dietary trend, Mila contains the perfect ratio of 3:1 (3 Omega–3’s to 1 Omega–6), all of which makes Mila essential for maintaining a healthy heart. Mila has a vasodilatory effect by increasing the size of the arteries and can play a role in lowering blood pressure. Did you know that every ninety days your body regenerates nearly all of its seven–to–ten trillion cells? When healthy, stronger, smoother, more elastic cells are properly regenerated, the aging process is slowed. Aging happens when damaged cells are replicated. Mila’s antioxidants act to neutralize the free radicals that cause premature aging. Mila is so nutrient-dense that the equivalent nutrients can only be acquired by consuming an amount of food that represents approximately 6 times the calories of Mila. For example, consuming 3½ oz. of Mila results in about 6 times fewer calories from the combined best sources of the same nutrient. In addition, Mila”s exceptionally high level of Tryptophan (an amino acid that suppresses appetite) may relieve hunger pangs. Mila can easily be used in formulating meal replacements. Mila has a vasodilatory effect by increasing the size of the arteries and thereby can play a role in lowering blood pressure. 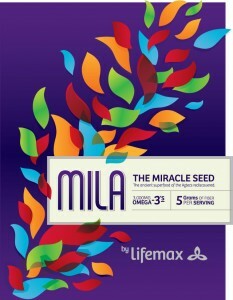 Omega-3s are known to lower high blood pressure, and Mila is densely packed with Omega-3s. It helps to unclog arteries, open up blood vessels and allow for greater blood flow. Gram per gram, Mila contains six times more calcium than milk. Mila is a rich source of other essential minerals like phosphorous, magnesium and iron, all of which aid in the absorption and utilization of calcium by the body. Salvia hispanica L.’s nutrient-dense qualities and Omega-3 content has been shown to assist in the management of proper blood sugar levels. When Mila® is mixed with liquid, a gel forms in the stomach that acts as a physical barrier, blocking digestive enzymes from breaking down carbohydrates. This slows the conversion of carbohydrates into sugars, helping to prevent the dizziness and fatigue usually brought on by a crash in blood glucose level. When Mila is mixed with a fluid, it absorbs a certain amount of that fluid. This makes Mila a hydrophilic colloid. This important property aids in the digestion of food and helps control excess acids associated with indigestion, heartburn and sour stomach. It can even help prevent against diverticulitis. Mila’s unique soluble fiber content combined with its hydrophilic colloidal properties make a gel in the stomach. This gel creates a physical barrier, lining the stomach.